Who Spends The Most On Booze At Cruising Altitude? One of the interesting things about travel by air is that it's perfectly acceptable to drink alcohol at any time of day. If you have an adult beverage on a flight, what's your drink of choice? No matter where I am, I always like a good craft beer, but with few exceptions, good beer isn't easy to find on many flights. Plus, drinking beer on a plane tends to make me want to burp a lot. If there's not a good beer available or I want to mix it up, I sometimes go for a Jack & Coke or a gin & tonic. On the rare occasion that I'm up front, I'll never turn down the free champagne. So who spends the most while getting their drink on at 35,000 feet? Las Vegas tops the list, which should surprise no one. People traveling there on leisure want to hit the ground running, in a party sense. And since you can't get one of those tacky frozen margaritas in a yard glass with a necklace on a plane, you'll just have to pre-game by spending $5-7 per swill on your way to Sin City. 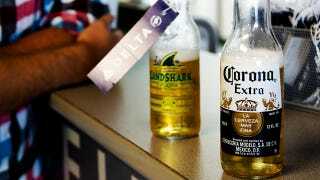 Good Morning America says passengers spent $2.69 million on alcohol while flying to Vegas during a three month study period, which averages $93 per flight. Seattle ranks second, averaging $79 per flight. Fort Lauderdale came in third with an average of $68 per flight, followed by San Francisco and Phoenix at $65 per flight. Airborne alcohol has been known to cause its problems too, of course. Last month, an intoxicated passenger on a Virgin Australia flight tried to rush the cockpit door in Bali, causing a terrorism scare. For the rest of us who can exercise self-control, we can all agree that a drink or two can make the experience of flying in economy a lot more tolerable.